It originates through the lower border of the rib above and attaches to upper border of rib below. The most superficial layer of rib cage and intercostal space is created by the external intercostal muscle. Its fibers are pointed downward and forward through the inferior border of the rib above towards the superior border of the rib below. The muscle spreads forward towards the costal cartilage where it is substituted by an aponeurosis, the anterior (external) intercostal membrane. 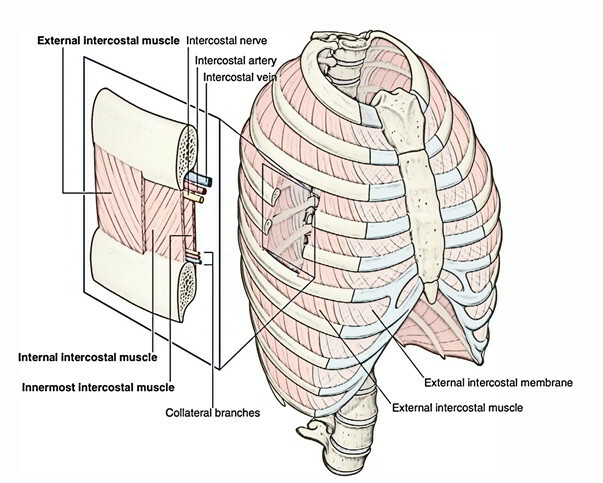 The eleven pairs of external intercostal muscles expand from the inferior borders of the ribs above to the superior margins of the ribs below, which are lateral edges of costal grooves. The muscle fibers pass obliquely anteroinferiorly when the thoracic wall is viewed from a lateral position. The muscles extend around the thoracic wall from the regions of the tubercles of the ribs to the costal cartilages, where every single layer proceeds as a thin connective tissue aponeurosis called the external intercostal membrane. During inspiration the most active muscles are external intercostal muscles. The fibres of the external intercostal muscle go downwards, forwards, and medially, however, the fibres are go downwards as well as laterally in the posterior part. It elevates the ribs during inspiration (inhaling). Supports the intercostal space structurally and functionally. A supracostalis muscle, from the anterior end of the first rib down to the second, third or fourth ribs occasionally occurs, which is in progression along with the external oblique or serratus anterior.